Rear Suspension Cast aluminium double-strut swingarm with eccentric adjustment for rear axle, central spring strut, spring pre-load hydraulically adjustable (continuously variable) at handwheel, rebound damping adjustable. Rim, rear 6.00 x 17"
Length 2056 mm / 80.9 in. Wheelbase 1422 mm / 56 in. Seat Height 820 mm / 33.3 in. Fuel Capacity 17.5 Litres / 4.6 US gal. The 2013 BMW S1000RR sports the water cooled four cylinder inline engine of solely 59.8 kg delivering a top power output of 142 kW 193 hp at 13,000 rpm and a top engine speed of 14,200 rpm. The 2013 BMW S1000RR max torque of 112 Nm is reached at 9750 rpm. The 2013 BMW S1000RR comes standard in Canada with Race ABS, Dynamic Traction Control and Gear Shift Assist. The 2013 BMW S1000RR first year in production revolutionised the super-sport market, out performing the more conventional competition which has dominated the market for the past decade. The new 2013 BMW S1000RR knows no compromise, providing the highest level of sporting character and riding dynamics. The new 2013 BMW S1000RR are its improved handling with absolute riding stability, supreme engine performance with perfect everyday practicality, and a resounding dynamic performance. 2013 BMW S1000RR have been no changes to the superior engine power of 142 kW 193 hp with a weight of only 204 kilograms including 90% fuel 206.5 weight with Race ABS. The revised 2013 BMW S1000RR model was to improve ridability by boosting thrust and enhancing the linearity and harmoniousness of the power and torque curves. 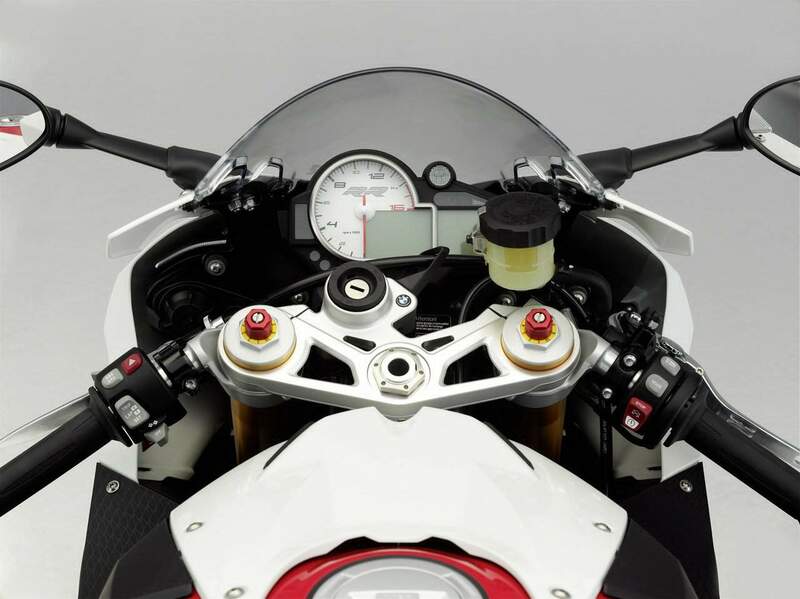 The new 2013 BMW S1000RR not only benefits from the advanced developments for the engine, suspension, and cockpit. The new 2013 BMW S1000RR testifies to its direct relationship with BMW Motorrad Motorsport. 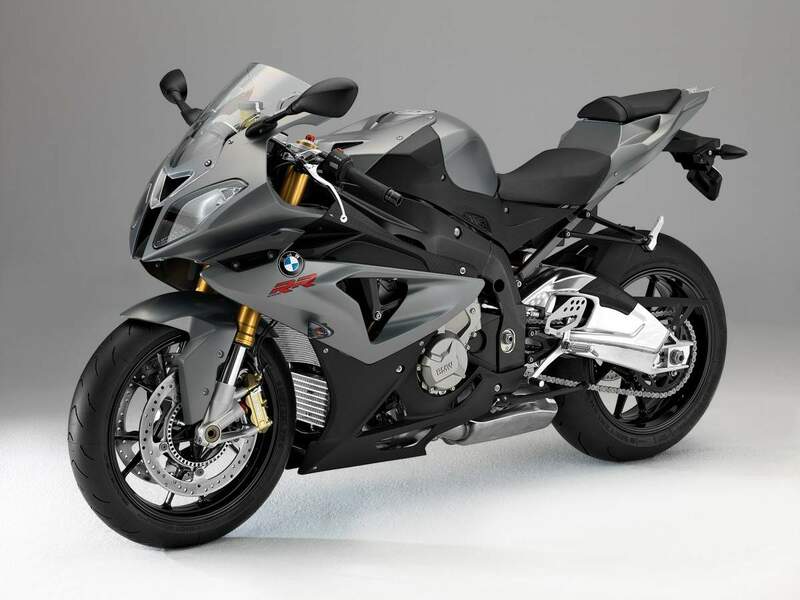 The 2013 BMW S1000RR matching swing arm either presents an anodised coating or is kept in black. The 2013 BMW S1000RR stabilisers on the passenger footrests have now been designed for a leaner look. 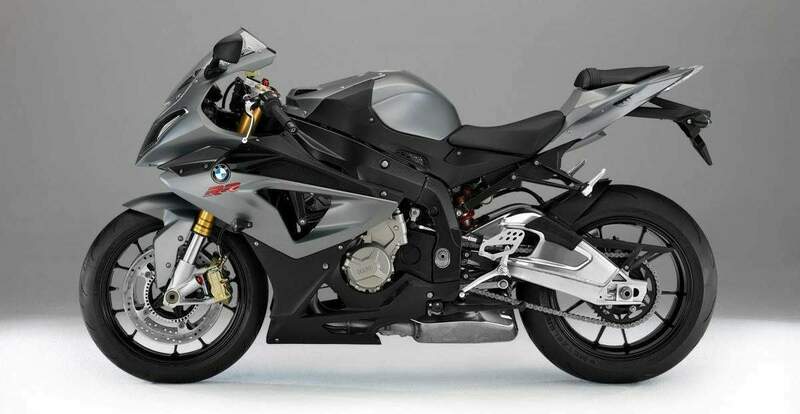 The 2013 BMW S1000RR has a price of $15,050 USD. Also the heated grips offering two levels and fitted as optional extra can take the bite out of the early morning run on the racetrack or longer rides in cold weather. The only bike capable of topping the 2011 BMW S1000RR? The 2012 S1000RR. In its 2009 debut, the bike crushed its competitors, offering unprecedented power and sophisticated electronics carried in an excellent-handling and lightweight package. It was more than the competition could handle, and will remain so until another manufacturer steps up its game to match BMW’s ultra-potent superbike. After riding the ’12 model, I can say that it looks like another grim year for any liter-class superbike not wearing a BMW badge. Not only has the S1000RR been a smashing success in magazine comparisons worldwide, but the RR, according to BMW, is the best-selling 1000cc sportbike on the market, and by a large margin. Even prior to the release of the original model in ’09, BMW was already hard at work testing and developing this second-generation S1000RR. Key areas that project manager Josef Mächler and his team wanted to address were creating a better handling chassis, refining the electronics and increasing punch on corner exits, all while maintaining the class-crushing power delivery that the RR has become famous for. The international press launch for the new model took place at the Ricardo Tormo Circuit just outside of Valencia, Spain. With five track sessions over the course of the day, we had ample opportunity to work our way through all of the riding modes and get a taste of the improvements. After our first couple of sessions on the track, during which we tried a revised Rain (allows more power), Sport and Race modes, we let the S1000RR off its leash for some uninhibited Slick-mode riding. The RR never ceases to amaze, with a claimed 193 crankshaft horsepower (our “Electronic Warfare” shootout-winning test unit produced 179 hp at the rear wheel on the CW dyno), Dynamic Traction Control and Race ABS, the RR gives the rider the confidence to ride with a level of aggression that would likely otherwise make a leather-clad pilot deposit himself into the gravel trap via a nasty highside. A world-class MotoGP venue is one of the only places that you can realistically flip off the safety and squeeze the S1000RR’s trigger. Composed primarily of second- and third-gear corners and then a 160-plus-mph, fifth-gear front straight, the track offers a lot of opportunity to wick the throttle open and experience the RR’s amazing acceleration. But in that department, the BMW is already a know entity. It’s the chassis geometry changes that were the primary focus of the bike’s reengineering. According to chassis project manager Ralf Schwickerath, every design team makes compromises that ultimately make it into production. So even before the first-generation S1000RR was complete, the team was thinking ahead to this bike and what they would alter on RR 2.0. Specifically, Schwickerath’s team wanted to make the S1000RR turn better, while retaining the stability that they felt they had nailed right out of the gate. A new frame features a revised steering-head angle of 23.9-degrees (was 24), a shorter 56.0 inch wheelbase (0.4 shorter) and slightly more trail. In order to maintain the desired stability, fork offset was reduced, the swingarm’s pivot point was raised (0.15 in.) and the shock’s length was reduced. Further, fork tubes were pulled up through the clamps 0.2 in. These changes work. Valencia has a nice variety of corners including a ridiculously fast left hander that leads into the final corner before the front straight, as well as several 180-degree carousels that really test front-end grip and handling, mixed in with a bunch of fast 90s that tax front-end stability. Communication from the front was excellent and confidence inspiring, even on the standard (and excellent) Metzeler RaceTech K3 rubber. Updates to the suspension include revised internals, which allow more pronounced and effective steps between clicker adjustments front and rear. Additionally, the shock now has a check valve that keeps rebound changes from altering compression settings. BMW testers Nate Kern and Jürgen Fuchs dialed in the suspension before our arrival, result being I didn’t touch an adjuster all day. If you only judge engine performance by looking at a dyno sheet, you would miss the point of the changes that BMW made to the 1000cc inline-Four. Simplification of the power delivery in each of the four modes means that there are now only two power-delivery characteristics: a mellower curve is used in Rain mode, while the other three all get a direct and responsive delivery from the ride-by-wire system. A lighter throttle spring and shorter pull allow you to feed the power in quicker, while a one-tooth-shorter (45, up from 44) rear sprocket and alterations to the mapping make up for the “lack of midrange” that BMW apparently felt the bike was missing. Really?! If the RR didn’t have such an excellent traction-control system, the last thing on earth you would want is to put the power down quicker. But with that enormous electronic safety net there to catch you, not only can you lay it down immediately, but you can also use the throttle to help you finish corners without having to spend a lifetime developing Garry McCoy-like rear-end-steering skills. Few, if any, bikes allow such aggression to be so controllable and accessible. Improvements to the RR’s wheelie-control function and how it works in harmony with TC now keeps the power from cutting out as harshly as before—the front end would slam down abruptly in Rain, Sport and Race modes on ’11 and earlier models. Now, it is much smoother. But if you really want uninterrupted power, just switch it to Slick and let the bike catapult you out of the corner with the front tire skimming the ground. The riding in the RR’s Slick mode on a racetrack has to be one of the most exhilarating activities on Earth; you can have your sky diving, bungee jumping or bull riding. We’ll take a trackday on the S1000RR anytime.